Amarillo®: discovered and introduced by Virgil Gamache Farms in Washington State, Amarillo® Brand VGXP01 cv. is an aroma variety that has recently become one of the top 10 varieties utilized by the craft beer industry. It features relatively high alpha acids along with extremely high levels of myrcene for citrus and grapefruit flavors. As a result, it is an excellent dual purpose variety. Amarillo demonstrates good resistance to downy and powdery mildew. Style Guide: American Pale Ale, Red Ale, India Pale Ale, American Wheat, Bitter, Wheat Beer, ESB. Substitutes: Cascade, Centennial, Summit™, Ahtanum®, Chinook, Saaz. 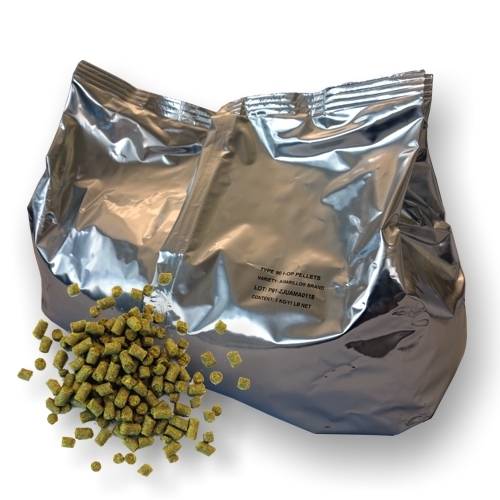 Hops are packed by producers in hermetic bags which preserv aroma and bitterness of hops for at least 3 years from packaking date. "Best before" date is indicated on each bag.